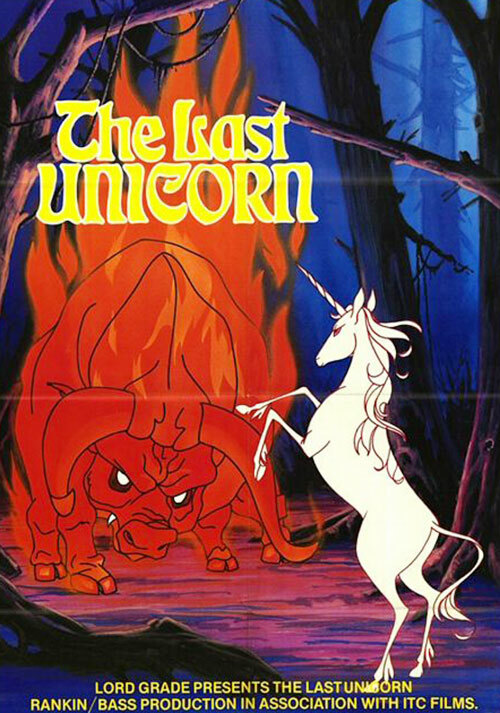 The Last Unicorn was a 1982 animated movie, released in theatres. It had an unusual level of ambition and sophistication for an American animation for children back then. Notably, it took the then-rare step of having famous, well-regarded actors do complex voice work. The main and titular character was thus voiced by Mia Farrow. 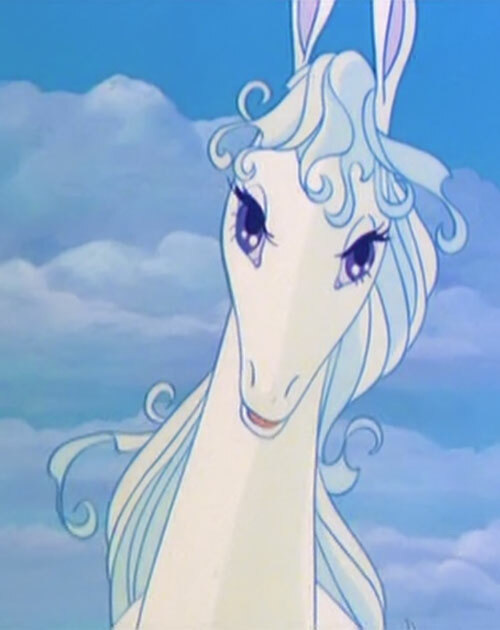 Other Aliases: The Lady Amalthea, a white mare. Base Of Operations: A certain Enchanted Forest. Height: 4’0” at shoulder Weight: 150 lbs. Eyes: Deep purple Hair: White. Other distinguishing features: Her eyes cast no reflection; regardless of her form. She also has the pink star pattern on her forehead where her horn protrudes. The Last Unicorn is one of the immortal creatures of her world. Her horn glows when she uses her various magical abilities. Her ability to unlock any lock or unbind any binding also derives from her horn’s magic. Beyond her horn, the Last Unicorn is very good at hiding from hunters. It is stated in the very beginning of the film that her very presence enables the animals to hide more efficiently from hunters. Other magical beings and magical effects around her become stronger by her presence. Some things that aren’t magic may become so because of her presence. Similarly, her presence changes environmental conditions. At the very end of the film, when she enters the dark woods at the very end, they light up. And at the beginning of the film, the two hunters notice that it is always spring in her woods. There’s no summer, no autumn, no winter. Finally, the Last Unicorn showed her determination when she stood and backed down the Red Bull alone. The Unicorn lives in a forest that has grown magical over time because of her presence. The creatures that live in such an enchanted forest learn a little magic of their own in time, mostly of the stealth-enhancing sort. In a unicorn’s forest, neither the leaves nor the snow ever falls. It is eternally spring-time. The Unicorn overheard some hunters saying that she was the last unicorn in the world. She could hardly believe it. She asked a traveling butterfly, but all he wanted to do was sing and tell stories. Still, the unicorn was able to get a clue from this addled wanderer about what may have happened to the other unicorns. She departed on a quest to find the truth. After a year of travel she encountered her first human. This poor farmer thought she was only a white mare. This gave the Unicorn hope – perhaps others of her kind remained, but had also been mistaken for mares. Unfortunately, while the Unicorn was sleeping, a traveling freak-show happened by. It was Mommy Fortuna’s Midnight Carnival, owned by a witch. When Fortuna saw the Unicorn she was shocked, for she thought they were all gone. The witch cast a sleep spell on the Unicorn and caged her. On the first night of the show, Fortuna had to put a fake horn on the Unicorn so the commoners would believe she were a real unicorn. They hey could not see the Unicorn for what she really was. Schmendrick the Magician, who could see her for what she was, tried to free her with his magic but failed. He had to settle for picking the lock. Once free the Unicorn freed the other animals using the power of her horn. That included her antithesis the immortal Harpy, Celaeno. The Harpy attacked and killed both Mommy Fortuna and her henchman Rukh. But the Unicorn and Schmendrick escaped. They were soon overtaken by outlaws. The Unicorn was able to hide, but Schmendrick was captured. He was tied to a large tree. The Unicorn freed him in the night. As they were leaving, Molly Grue of the outlaws spied them and cut them off. When she realized a real unicorn was before her Molly insisted on joining the duo on their quest. She knew the way to King Haggard’s castle, where they might learn the fate of the other unicorns. While in King Haggard’s country, they were set upon by the Red Bull. The Red Bull chased the Unicorn during the night, herding her back towards the castle. To save her, Schmendrick used his unpredictable magic to transform her into a human woman. The Red Bull, no longer sensing his prey, walked away. The trio arrived at King Haggard’s castle. 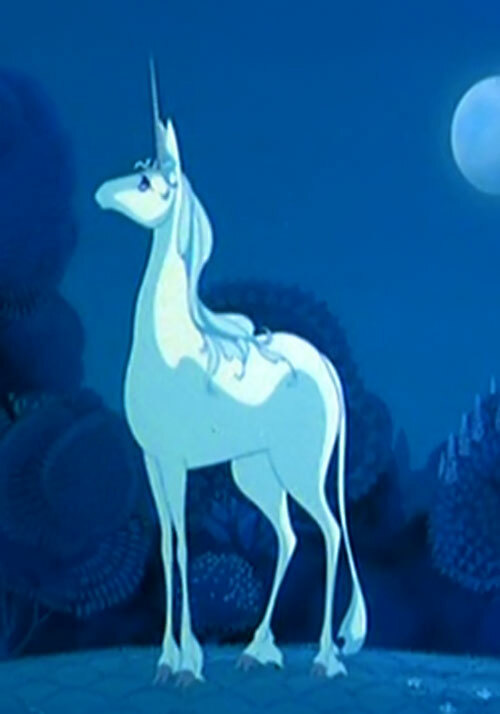 Schmendrick introduced the Unicorn as the Lady Amalthea. They asked for jobs, but the King already had a more powerful magician. Molly insisted, arguing that Schmendrick was easier to work with. The King ended up agreeing and hired the three of them. The King’s magician irately appeared in a puff of smoke. He created a tornado right in the King’s chambers. A glow came from the star on her forehead, cancelling the magician’s spell. Molly Grue cooked and cleaned. Schmendrick juggled and played the jester for the king. “The Lady Amalthea” stood and stared into the sea. Prince Lir tried to win her heart by doing great deeds, but the Unicorn remained unimpressed. Schmendrick tried to find a way into the Red Bull’s realm. Meanwhile, King Haggard tried to prove that the Lady Amalthea was a transmogrified unicorn. And thus did the King reveal what he had done with the other Unicorns. It was him who had sent forth the Red Bull. And the Bull had chased all the Unicorns into the sea one by one. The King wanted the unicorns because when he was young he had spotted one. The sighting had filled him with joy. King Haggard had spent his entire life trying to find something that would make him as happy. Some things did give him joy but only for a short time. Only the sight of the unicorns had caused him lasting happiness. So, he bade the Red Bull bring them all and keep them trapped in the sea for him to see. Each time the King looked upon the unicorns it was as it was when he was young again. However, by this time the Lady Amalthea had forgotten herself too much. Even she could not see the unicorns in the sea anymore. Schmendrick discovered the way to the Red Bull’s lair. He, Prince Lir, Molly Grue, and the Unicorn went in. Schmendrick intended to restore the Lady Amalthea to her true form. But when she heard about it, she didn’t want to be changed back. She pleaded to stay human and grow old with Prince Lir, whom she loved. But Prince Lir would have none of it. Being a hero, he knew things had to happen in their own time and that a quest could not be abandoned. The unicorns had to be rescued. As Schmendrick and Molly argued over Lady Amalthea’s fate, the Red Bull suddenly appeared before them. The beats realised that there was a Unicorn before him hidden in mortal form, and he gave chase. Schmendrick transformed the Unicorn back to her normal state and she was chased towards the sea. The others could only watch helplessly. Prince Lir, being a hero, tried to help by getting in the way of the Bull but was trampled down. Seeing that her love had been killed trying to protect her, the Unicorn turned and fought back. The Red Bull never had a unicorn stand up to him, and soon backed down. The Red Bull was forced into the sea by the Last Unicorn. Thus all the captured unicorns were free to go as they pleased. They exited the waters en masse. The thundering hooves of hundreds of unicorns caused King Haggard’s old castle to crumble under its own weight. The castle fell into the sea and King Haggard with it. On the beach all were in tears for Prince Lir. The Unicorn touched him with her horn and magically, he lived again. 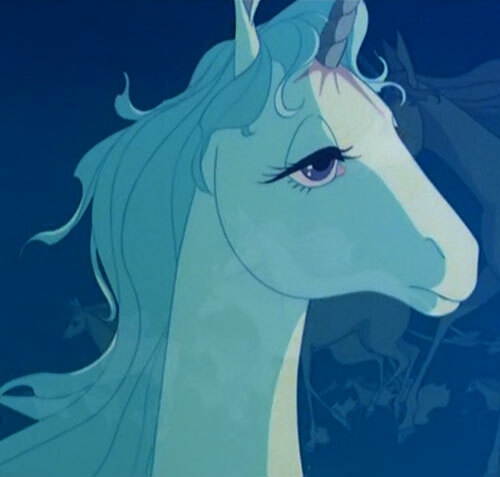 The Last Unicorn was the only Unicorn to ever know love or regret. She gave her good-byes and headed to her enchanted forest home. 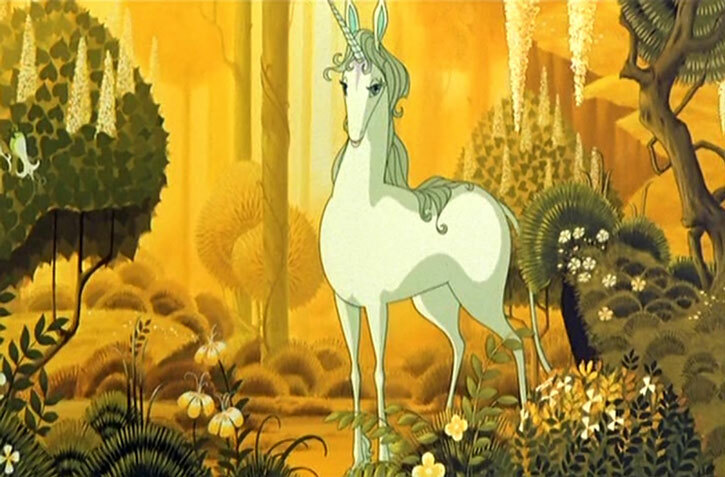 The Last Unicorn is light and nimble in body, much like a deer in size but very much in appearance as a horse. She has one long spiraling horn coming out of the center of her forehead. A pink star is emblazoned there where the horn protrudes. Her hooves are also split like a deer and she has a tuft of hair just above each one. Her tail is more like a lion’s tail with only a tuft of hair at the end. Her horn and hooves are light blue but the rest of her is white as snow. She seems aloof and above any situation of mortals. However, she feels a deep kinship to any immortal creature and cannot bear to see them suffer. By the end of her quest she feels regret and the loss of true love. She is fearful of what the future might hold for her. 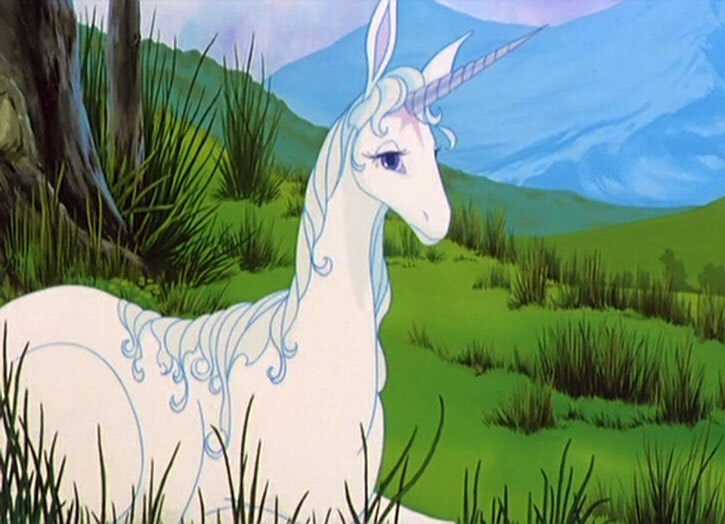 The personality of the Last Unicorn would very possibly be different by the time of most campaigns. As mentioned, she is the first Unicorn to regret anything, and perhaps she still feels the loss of her love, who gave his life to save her. As a magical being she would likely be unknown to most of the world except to those in the mystical community. Perhaps one of the PC’s (the noblest and most likely to sacrifice himself for another, even if he is the ugliest) turns out to be the Prince’s reincarnation, and the Unicorn decides to help him somehow. Or perhaps she is once again the last unicorn (instead of the last one not trapped, the last one as in the rest have left for brighter, more innocent worlds), and only she has knowledge the PC’s would need. Even moreso, perhaps the Red Bull has begun to hunt down heroes or mystics, and they need her help to know how to properly stand him down. Claws, Illusion, Invulnerability, Neutralize, Speak with Animals, and Weather Control are Mystic Linked. Flash is only useable as a steady glow and is contingent on the Last Unicorn using one of these powers: Enchantment, Invulnerability, Neutralize, or Thief (Escape Artist, Locks and Safes). 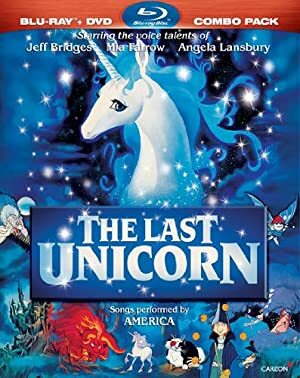 The Last Unicorn’s horn will glow blue (+0). Illusion is always on (-1FC) and may only be used to hide the Unicorn’s true appearance, causing others to perceive her as only a white mare (-3FC). Neutralize only affects powers of a magical nature or Mystic linked powers (-1). 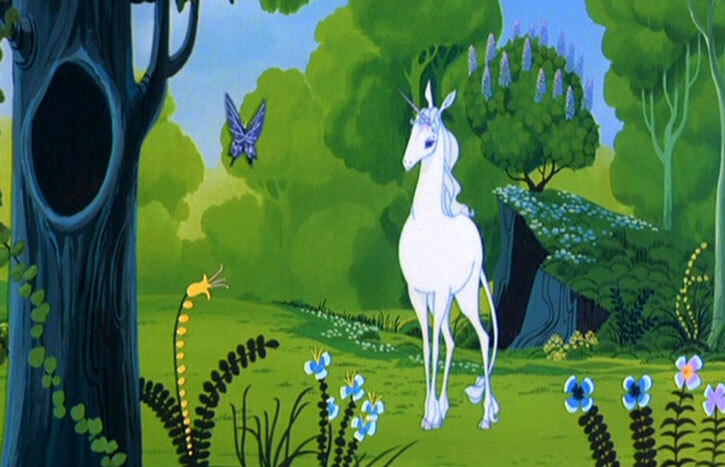 Weather Control only becomes active in an area where the Last Unicorn lives as her home. Weather control will only attempt to make conditions of wind, precipitation, and temperature a perpetual springtime (-3). Thief (Escape Artist, Locks and Safes) are Powered Skills and she must be able to touch the lock or binding object with her horn (+20 B.C.). Headquarters (expansive, Enchanted Forest), Immortal, Life Support (no need to eat). Schmendrick the Magician (High), Molly Grue (High), Prince Lir (High). When the Last Unicorn thinks about all the other unicorns being chased by the Red Bull she seems to see a vision. I didn’t give her any power or “effect” that would cause this vision to come to her. I believe it’s not actually a vision but just her own terror-filled imaginings of the event. 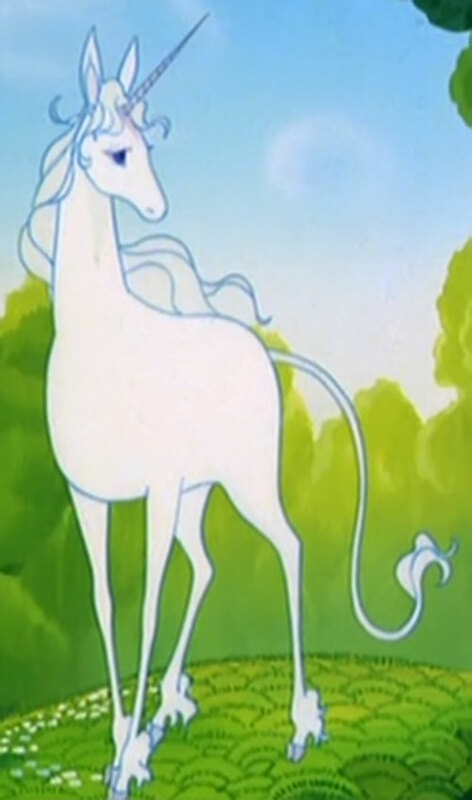 The Last Unicorn could very well have more magical abilities but what I have listed is what was displayed in the film. Schmendrick the magician changed the Last Unicorn into a young girl to save her from the Red Bull. I’m assuming Schmendrick used a spell that mimicked the Transform power. Since it’s mystic based it would have gone against the Unicorn’s INFL/Spirit. The Unicorn could have changed herself back using Aura/Aura if the spell hadn’t also had a memory stealing ability. In this new form the Unicorn had lost her Thief skills, Claws, Illusion, and perhaps other powers as well. She did retain her Neutralize power. She is frail in her new form and all stats drop to 02 APs, she likely has a Str of 01 but there is no evidence either way. Her physical stats drop immediately with the transformation and she loses her mental and mystical stats of her Unicorn form over time. By the end of the film she had lost all powers and skills and had very nearly forgotten all about her former life even losing some physical features like the star pattern from her forehead. Her eyes began reflecting as other human eyes do. She gained the Drawback: Minor Irrational Attraction to Prince Lir and Serious Psychological Instability (Memory Loss). She also gained the Advantage: Attractive. 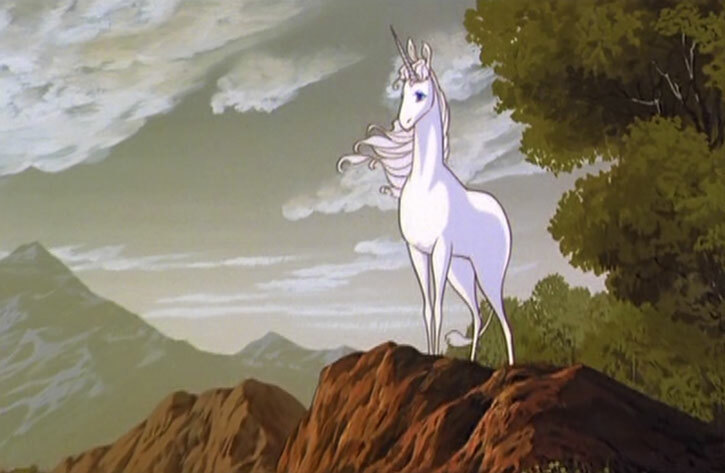 Source of Character: The 1982 movie The Last Unicorn, a Rankin/Bass production. Based on the excellent Peter S. Beagle book by the same name; Beagle also wrote the movie’s screenplay. Voiced by Mia Farrow. Helper(s): “Animal File” on W.org; Wikipedia, Darci, William Chamberlin, eclectic scholar, Adam Fuqua, unicorn epiphany. Writeup completed on the 19th of June, 2014.